Pencader ( Welsh pronunciation) is a small village in the Welsh county of Carmarthenshire, and is part of the Community and Parish of Llanfihangel-ar-Arth. It is located around 3 miles (5 km) south-east of Llandysul and 6.5 miles (10 km) south-west of Llanybydder, in the valley of the Gwen brook, shortly before the confluence with the River Talog, to form the River Tyweli (a tributary of the Teifi). It is a quiet village with little more than 500 houses, two shops, and two pubs. Pencader's history goes back a long way. For many years, it was one of the main stops on the Carmarthen - Aberystwyth rail route, and was the junction for the service to Newcastle Emlyn; the Pencader Tunnel enabled services to reach Carmathen via Llanpumsaint. The decline of the railways saw the Newcastle Emlyn branch line closed in 1952 and the main line closed to passengers in 1965. A battle was fought here between Gruffydd ap Llywelyn and Hywel ab Edwin in 1041; Gruffydd was the victor, and went on to become the first and last King of Wales. 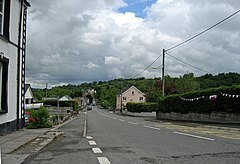 Pencader hosts the site of an old castle, which was probably erected by Gilbert de Clare, 1st Earl of Pembroke in 1145. The broad gauge Carmarthen and Cardigan Railway connected Pencader to both the West Wales Line of the Great Western Railway, and north to Newcastle Emlyn. From 1845, a scheme was proposed to connect the industrialised Northwest England and Manchester to the deep water port at Milford Haven, to provide an alternative to the congested Port of Liverpool. Given Parliamentary approval in 1865 as a standard gauge railway, the Manchester and Milford Railway junctioned with the C&CR at Pencader, and then drove north to Strata Florida, and onwards to the coast at Aberystwyth. Having constructed and made operational the easy section from Pencader to Aberystwyth, the M&MR ran out of money trying to build the connection from Llanidloes to Strata Florida, leaving the 1.5 miles (2.4 km) stub of the Llangurig branch from the Mid-Wales Railway. The M&MR was absorbed into the GWR in 1911. Under the Beeching Axe of British Railways, in 1965 passenger services to Pencader ceased, with freight and goods ceasing in 1973. The station has been demolished, and the site is now used as a lorry haulage depot. ^ "Town and Community Clerks". Carmarthenshire County Council. 4 January 2011. Archived from the original on 2 May 2011. Retrieved 13 January 2011. ^ Adrian Pettifer (2009). "Pencader Castle". Welsh Castles. castlewales.com. Retrieved 10 June 2010. 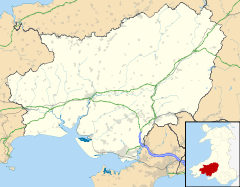 Wikimedia Commons has media related to Pencader, Carmarthenshire.